224 pages | 27 B/W Illus. Digital Development in Korea explores the central role of digital information and communication technology in South Korea. Analysing the role of ICT in green growth and sustainability, this new edition also demonstrates how concerns over public safety and the Olympic Games, are shaping next generation digital networks. Presenting a network-centric perspective to contextualize digital development politically, economically and socially, and in relation to globalization, urbanization and sustainability, this book builds on firsthand experience to explain the formulation and implementation of key policy decisions. It describes the revolutionary changes of the 1980s, including privatization and color television and the thorough restructuring that created a telecommunications sector. It then goes on to explore the roles of government leadership, international development and education in affecting the diffusion of broadband mobile communication, before weighing up the positive and negative aspects of Korea’s vibrant new digital media. 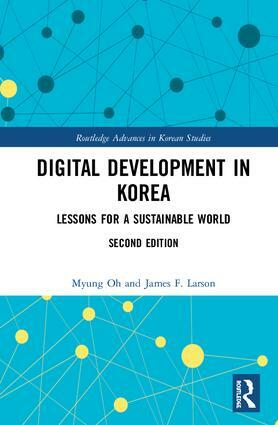 Seeking to identify aspects of the Korean experience from which developing countries around the world could benefit, this book will be of interest to students, scholars and policymakers interested in communications technologies, Korean Studies and Developmental Studies. Myung Oh is a former Deputy Prime Minister of Korea, who held four ministerial positions under four different administrations, beginning with service as Minister of Communications in the 1980s. The founder and honorary president of SUNY Korea, he holds a Ph.D. in electrical engineering from Stony Brook University, USA. James F. Larson is a Leading Professor at SUNY Korea where he previously served as provost and chair of the Department of Technology and Society. He holds a Ph.D. in communication from Stanford University, USA.